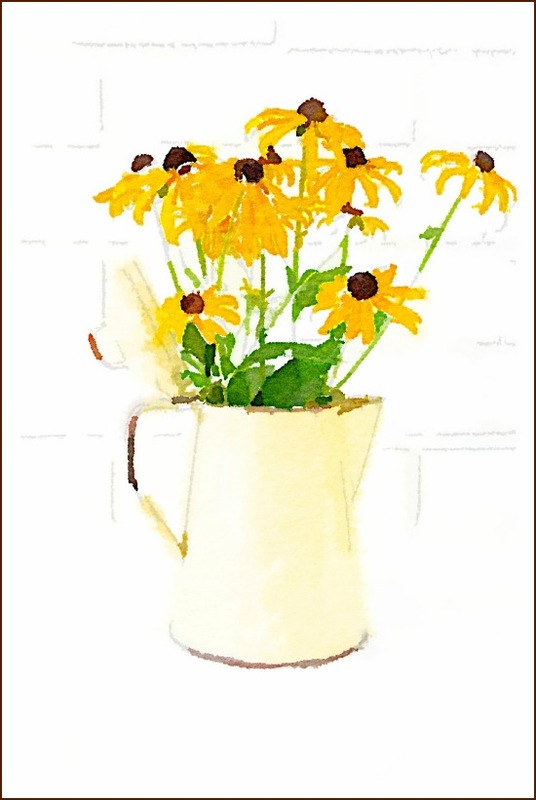 DIY Fall Watercolor Printables: Sunflowers, Mums & Black-Eyed Susans. Easy to do, diy fall watercolor printables that make instant wall art! I believe that we all should be able to decorate our homes with things we love. I also believe that beautiful art work doesn’t have to break the bank. These DIY fall watercolor printables are instant digital downloads and are completely free. They will join my Watercolor Printable Series: Flowers & Herbs. 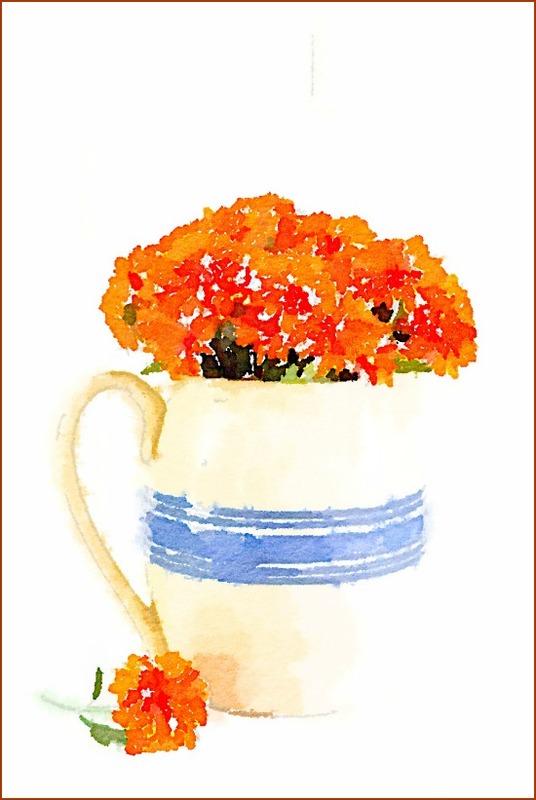 No…I didn’t actually paint them, but I styled the flowers, took the still life photographs, and digitally transformed them into watercolors. I used my painted brick fireplace hearth as the backdrop for all three images. They were taken on different days, but with special editing, I was able to tweak the lighting so they look uniform. Here are the three diy fall watercolor printables available as free downloads. When I printed mine, I sized them as a 5 x 7 in the print program. That way I was able to fit them in my existing mats. If you didn’t want to use a mat, you could print them as an 8.5 x 11 and they would fit nicely into an 8 x 10 frame. An 8.5 x 11 diy fall watercolor printable would also fit beautifully into an 11 x 14 frame with an 8.5 x 11 mat. If you want to try making your own DIY wall art with these summer watercolor flower printables, I have my favorite frames (including mats) and cardstock listed in my Amazon Shop. Simple shopping at your fingertips. Then decide where to hang your frames, but make sure it’s someplace where you can see and enjoy them. Here is the full Flower Series Collection so far. click HERE or the button below. Thank you so much for stopping by…see you soon. Love to make banners and DIY wall art? Cards & other crafting projects? 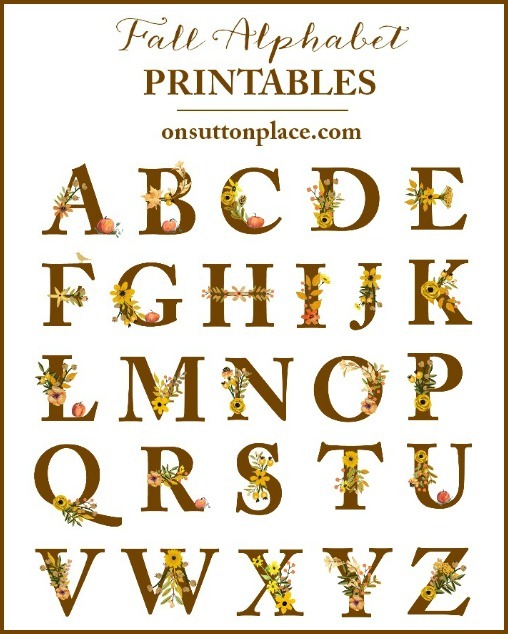 Click HERE to see my Fall Floral Alphabet Printables! I enjoyed your blog and got a lot of interesting ideas which I intend to build on. Thank you. You have a beautiful, comfortable appealing home. I LOVE, LOVE, LOVE the watercolor prints. I just printed them and even with my old printer the look fantastic! I can’t wait to try and print some of my pics with your tutorial. Thanks Ann! Beautiful! I love watercolors best of the paint mediums, but can’t paint pictures well at all! Problem solved! Thank you for this tutorial. It is amazing how Waterlogue changes a picture…pure perfection without even lifting a paint brush. I have a few how-to watercolor books in my library. I have always wanted to tackle a few painting projects with watercolor. The app will do just fine until I have time to teach myself watercolor painting. What an incredible post. I had no idea such creativity was available. I can’t wait to explore it deeper. Thank you so much for sharing all your wonderful ideas. OHHHHHHH…I LOVE these watercolor prints! Thank you so much Ann!! Great job of walking through the process. Love the final results! Fantastic post. I have been wanting to try this and just haven’t gotten around to it. Now I am truly inspired! Thanks. Oh you would be so good at this Karen! Your photos are amazing and would make lovely gifts. Ann: your beautiful water colors are awesome. When you offer them up as free printables, it’s like Christmas! Thank you for your beautiful work, and your willingness to share it with us! You are welcome Vicki…Merry Christmas! Nice job, Ann! These are beautiful. Thank you for sharing the downloads. I did something similar recently in our master bedroom. I took a couple pictures of our new home from different angles and used Photoshop to achieve the watercolor effect. Then I had them printed on linen paper. Such a neat idea! Exact same thing Sarah…great idea! I struggle with Photoshop. I have PS Elements but am not very good at it. Love that you took pictures of your home. I finally got around to blogging about the watercolor photos I did (and linked to you): http://www.mommade.org/2014/09/digital-watercolor-home-prints.html. Thanks again for the inspiration, Ann! Thank you for the mini tutorial on making any pic a watercolor pic. I cannot wait to try this!! These are beautiful! Thank you! I am especially fond of sunflowers. My plan is to print them off to frame and hang by a still life of sunflowers my Mom-in-law painted. Now to find some frames! Gorgeous printables! Love your original photos too! Thank you for letting me know Betty…it’s so good to hear from you. Enjoy! Beautiful!! As a watecolor artist I wonder why I paint when this is such an easy program, lol, oh my, I spend so many hours creating paintings when all I need is the click of a finger, lol,they are lovely!! Oh no Laurie this is not the same thing! It takes absolutely no talent. You have a gift and I’m so glad you use it…hope you are well. Thanks for stopping by! Oh….I got so excited I forgot to say….thank you for all the wonderful ideas you so eagerly share with all of us out here! You are such a blessing! Beautiful water colors!! I downloaded waterlogue and it is fabulous! Thanks for that great tip! I think I will do some pics of my grandchildren as gifts for their parents….and keep some for us as well! If you don’t mind me asking, which setting in waterlogue did you use? I’ve been playing with it and can’t seem to find one as detailed as yours. Maybe you tweaked it? I’m also going to download and print your darling pics for fall and Christmas! Love, love, love your blog! You are a genius! I LOVE this! Thanks so much for sharing. haha Kathleen I am so not a genius! This takes no talent but it’s a great way to get personalized art. Enjoy! Yay! Thank you for letting us know! How absolutely lovely! I just started thinking about DIY Christmas gifts I’d like to make. This has officially made the list. I’d heard of the app before but wasn’t aware of one for Android. So thank you Ann! Ann, what a beautiful gift you’re providing and thanks for finding some apps that do this with an Android. Leo has an ipad and he took a photo of our dog Lucy. It looks just like a dog portrait so I was going to suggest that those would make great gifts, too! Such a great idea that I’ve never heard of! Thanks so much for sharing – I’m so glad I started following your blog! I love that app…..no smart phone, I have an iPad….my sister has had some of hers printed at Walmart…. These are so fun, Ann! I love your photos but think I might try to capture my garden before it succumbs to cold weather. I downloaded your Christmas Printables and not only made 4 for myself, but did 3 as gifts! Thanks for your inspiration and fresh ideas! Yes Jan most definitely take pictures of your garden. What a wonderful idea! These are Beautiful!!! I did not know that this could even be done! I can hardly wait to frame these! THANK YOU for sharing Ann!! You are welcome Annette! It’s really my pleasure…thanks for following along. Oh my. Such a cool idea!!!!! I love these! 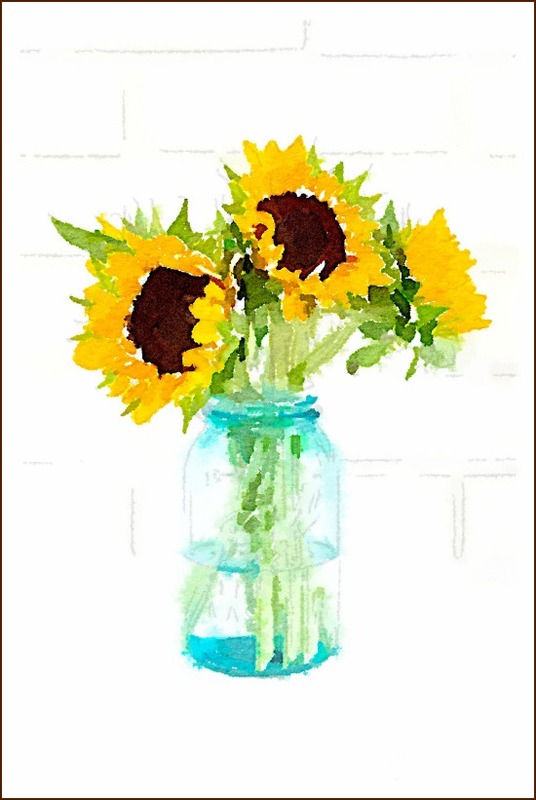 I immediately planned to stop on the way home from work and pick up sunflowers to re-create that pic…so sweet of you to post these free printables….I am still going to pick up the sunflowers….but I printed your version and popped it in the frame in my entry and it’s already hanging up! So quick….. Yes Carol definitely stop and get your sunflowers…your own pic will be wonderful! What a wonderful gift. For whatever reason….I can’t even explain…when I opened this post ….. It felt like a surprise electronic gift. Just for me. So…thank you, Ann, for getting my day off to such a mindful start. Gratefulness is a very lovely place to dwell. Your gift sent me there. Very cool! I just discovered an editor in picmonkey the other day that made my photo look painted. This is neat Ann! They look beautiful.